Bathrooms are the smallest rooms in our homes and sometimes they can be smaller than most closets. Your bathroom color should be influenced by not only the size of your room but whether or not you have windows in there​ since that will impact the lighting in the room. If your lighting is sufficient, you can get away with darker colors. Your first step in decorating your bathroom is to make sure that your lighting is perfect before you choose your paint colors to sample. The right lighting for your bathroom can give you many more color options, and help you eliminate the wrong ones quickly. Here are six awesome paint colors for a small bathroom. Choose from a warm or cool bathroom paint color for a relaxing retreat. Each one was chosen with a tiny space in mind. A small bathroom and a bold color? This can definitely work. A gorgeous deep color like Behr's Vintage Velvet works well in a powder room, where glamor is often more important than size. Powder rooms are the one room where a bit of drama is expected, so go for it! You can also choose a deep color for your small bathroom if you have the right lighting available. The right lighting could be lots of natural light or strategically placed sconces by the mirror and fabulous overhead lights. Don't let the size of your bathroom keep you from sampling some adventurous colors, that's what the samples are for. 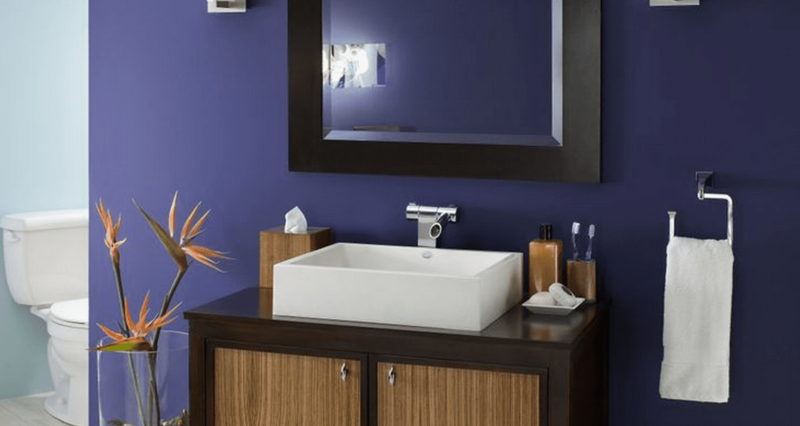 Spa blue paint hues are a favorite for small bathrooms. The airiness of pale blue or aqua seems to light up the walls. Sherwin-Williams Aqua-Sphere seems to bounce light around a small bathroom. Choose shiny metal accents and fixtures, fully white towels, and crisp white trim to complete the look. If you're painting your small bathroom with a light and bright blue or green, consider painting the ceiling as well. A painted ceiling in a light color can make your small bathroom look limitless. Neutral beige and taupe are natural choices for small bathrooms. With a simple color backdrop, you have unlimited options for accessories and linens. The warmth of Sherwin-Williams Neutral Ground strikes a nice balance with cool white and silver fixtures in most baths. The balance between warm and cool colors give your small bathroom a bigger look. Sherwin-Wiliams Requisite Gray is one of the most popular gray paint colors on the market. The fine line between gray and beige in this soft greige makes it a great choice as either a bathroom or bedroom color. Greige paint is soothing because it's just the right amount of coolness and warmth. Gray can be a wonderful color for small bathrooms, but you'll want to look for a warm gray or greige to balance out the cool white and silver found in most bathroom fixtures. Pale pink, blue, or green linens with white accents create a larger-than-life classic style. Pink, like Sherwin-Williams Charming Pink, is a small bathroom indulgence without the bonbon silliness of other pink paint colors. The slightly muted pink hue gives Charming Pink a more grown-up appeal for your walls. Pink is a light and airy wall color for a small bathroom with our without windows. Pair soft pink walls with deep brown or charcoal gray for a sophisticated vibe. Sherwin-Williams Ancient Marble is the perfect green for people who aren't sure they want green. This rock-like neutral has a touch of gray and green, allowing it to defy labels. A cool green-gray like Ancient Marble gives a natural style to a small bathroom, without being too light. Ancient Marble is perfect for a guest bathroom as it can be dressed up in a variety of ways with colorful accents, while still staying quite neutral.